Com-Pac International offers a white room facility for the production and inspection of various leak proof medical flexible packaging solutions for use in surgery, on surgical equipment, post surgical patient care and recovery as well as protection for post surgical monitoring devices and equipment. 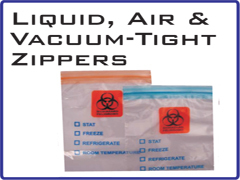 Our Bitran leak proof specimen bags have many uses in the patient care market such as ice bags, specimen containment and prescription packaging. Com-Pac International is dedicated to providing you with the custom product you need on budget and on time. For a custom quote on your specific medical packaging needs or to reorder any of our stock Bitran or medical packaging products call toll free 1-800-824-0817.